The new Lyons & Casey website was the perfect way for me to ease my way out of maternity leave and back into the Cookie kitchen. I got to work with two awesome women Mayrose Lyons and Taryn Casey, had loads of creative freedom and a blank slate and the added bonus of proper and gorgeous studio photographs! (Careful visiting Mark Nixon‘s website you can loose an hour there too easily) It also gave our newest employee Keith an opportunity to play around with a little JQuery and get some lovely movement into the one page site. Our tagline for our new social media service is “You Get Us & We ‘Get’ You”. When it came to working with a designer who would ‘get us’ there was no question of working with any other than Heidi at CookieWeb! One meeting and she got what we wanted. We are delighted with our beautiful one page website. And Heidi did a great job at creating it without any branding or logo or any other starting point. Who are Lyons & Casey? 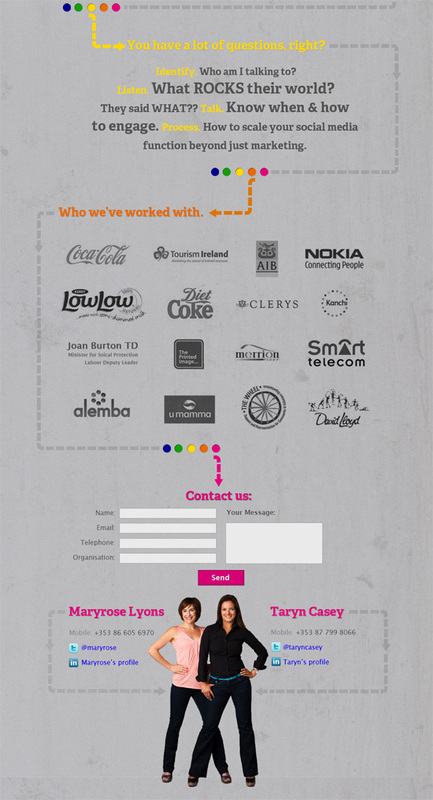 Maryrose Lyons and Taryn Casey are two of Ireland’s leading internet marketers and together they bring some serious experience to companies looking to really kick their social presence into top gear. They’ve worked with the big guys and they get actual results. But you can read all about them on their fab new website!